What if talking to Spanish-speaking patients were easy? Are you tired of struggling to communicate with Spanish-speaking patients? Do you wish you didn’t always need to wait for an interpreter (or just try to “get by” without one)? Essential EM Spanish is the online CME course that will prepare you to confidently perform a complete H&P and explain testing, treatment, and disposition in Spanish. Created by an ED clinician, Essential EM Spanish is organized around common ED chief complaints and clinical presentations. The course also uses a variety of learning tools to maximize your convenience and cater to any learning style. VIDEO: See and hear all the phrases, quiz yourself, and practice the pronunciation. AUDIO: Listen and practice on the go, such as during your commute or at the gym. MANUAL: Review all the vocab and go more in-depth with other topics including language basics, anatomy, bonus phrases, and more. CHEAT SHEETS: See all the phrases for a given chief complaint on a single page (front and back). Essential EM Spanish is organized around the 10 most common chief complaints in the Emergency Room, along with 4 bonus sections (Stroke, Cardiac Arrest/Arrhythmia, ROS, Disposition). 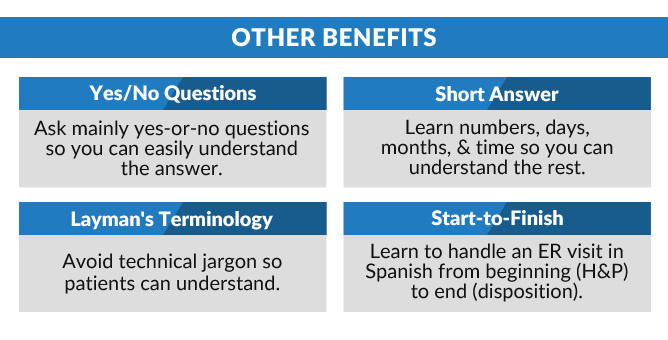 For each of the above sections you’ll learn all the Spanish you need to take a history, guide a physical exam, and explain your plan for testing, treatment, and disposition to the patient. WHAT ELSE SHOULD I KNOW ABOUT THE COURSE? The course uses yes/no questions so you can easily understand the patient’s responses, and layman’s terminology so the patient can easily understand you. 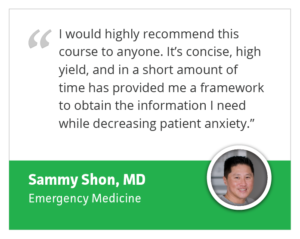 The course materials are designed to guide you through every step of an ER visit. Imagine yourself a year from now. Will you still feel frustrated when you encounter Spanish-speaking patients? 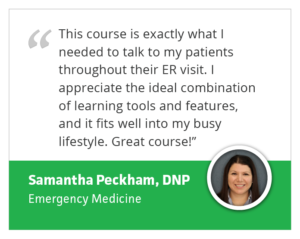 Or, with the help of this course, will you gain the confidence and skill you need to communicate clearly with them, resulting in an improved experience for both you and the patient? By starting today, you can build a skill set that will serve you for the rest of your career (and life). HOW TO REGISTER: Use the “REGISTER/TAKE COURSE” tab on this page to login or create an account, select your price tier, and enter a discount code if applicable. Wondering what the course materials look like and sound like? See samples and demos on this page. Have other questions or concerns about the course? See the FAQ list here. 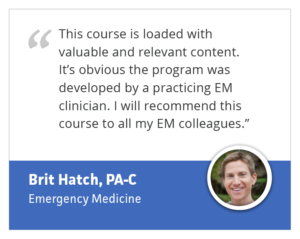 The target audience for the “Essential Emergency Medicine Spanish” course includes physicians, physician assistants, and nurse practitioners who practice in emergency departments and who are seeking to improve their communication with Spanish-speaking patients and the quality of care they provide for such patients. Complete a medical history and physical exam, and discuss testing, treatment, and disposition with Spanish-speaking patients who present to the ED with common and fairly straight-forward clinical presentations. Expedite communication with Spanish-speaking patients and their families, and therefore reduce potentially-harmful delays in care. Maintain or increase familiarity with differential diagnoses for common ED chief complaints. Learn anatomical terms in Spanish that are related to common ED chief complaints. Improve the consistency with which they use layman’s terminology when speaking to patients in both English and Spanish. Benjamin originally learned Spanish in high school before living in Guatemala for two years. Building on that experience, he continued studying Spanish in college and has traveled through much of Latin America, including two medical missions. 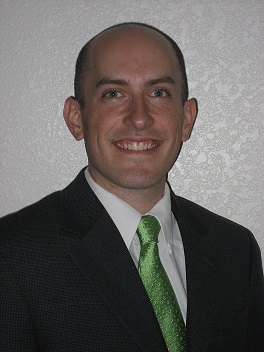 Benjamin has been practicing emergency medicine full-time in Las Vegas since early 2014 (with additional work experience in family practice and urgent care). He became certified to treat Spanish-speaking patients in the ED without an interpreter at the start of his career and has done so routinely since that time. 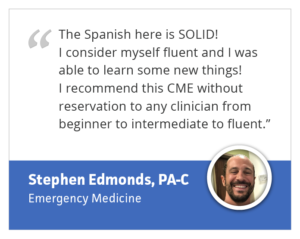 As the principal author of this course, he drew upon his extensive personal experience caring for Spanish-speaking patients in the ED. Disclosure: Benjamin has nothing to disclose. 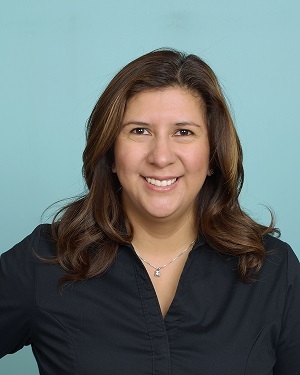 A native Spanish speaker, Carmen has been working as a Spanish interpreter with emergency department and other hospital patients in Las Vegas since 2010. Carmen reviewed the phrases used in the course to help refine and improve translations from the perspective of a medical interpreter. Disclosure: Carmen has nothing to disclose.